Barton Springs is Austin. 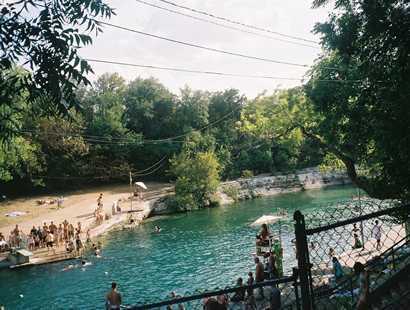 It is the largest natural swimming pool in the United States located within an urban area, setting Austin apart from other metropolitan cities. Barton Springs is Austin's soul and sums up everything that Austin stands for. A chilly swimming hole, the center of a political and environmental debate, a meeting place. Barton Springs is all of these things. Here you can swim with politicians, musicians, ducks and salamanders. If you're lucky, you might catch a glimpse of 'Leonard', a giant fish reputed to patrol the waters. Barton Springs has been used by people inhabiting this area for tens of thousands of years. In the days before air conditioning Austinites used the springs to stay cool. Barton Springs has powered several mills, cooled many Native American tribes, hosted Spanish missionaries, provided a community meeting place for early settlers, and soothed millions of people over the years. Half a billion years ago what was to become Austin was covered by an ocean on the edge of an ancient continent which would become North America. One-third of a billion years ago, the ocean closed in as massive plates of earth moved in from the southeast and crushed against the North American Plate, creating mountains from Arkansas to Uvalde, Texas. One-quarter of a billion years ago the mountains eroded into plains. 150 million years ago plates pulled away from North America and the sea rushed back in. Layered deposits of sediment, rich in fossils and dinosaur tracks, formed the limestone rocks and caves of the Edwards Aquifer. Water probably sprang from the rocks about 7,000 BC. Barton Springs, actually a series of springs, emerges from fissures in the limestone at a rate of 26 million gallons per day. People who have witnessed the water surging out of the mouth of the main spring, Parthenia, say it resembles a pulsating heartbeat. Parthenia is just to the right of the diving board. If you swim down to it you can see the mouth of a cave about three feet wide and five to seven feet deep. Water from Barton Creek no longer enters the pool; it is kept full from the springs alone, so the water is clearer and a constant temperature of 68�F. Eliza Springs issues from a cave-like sinkhole on the north bank near the lower end of the pool, and Walsh Springs comes from a sinkhole on the south bank below the pool. Deep Eddy Springs is actually somewhat connected but is covered by Town Lake. Barton Springs remained about the same until nine thousand years ago. We know that humans have been using Barton Springs for at least eleven thousand years. About 5,500 BC the Olmecs were known in the Western Hemisphere and probably used the springs. Wild horses, too, were once bountiful at the springs. Native American tribes such as the Lipan Apache, Jumano and Tonkawa gathered here to cool off and camp. A Comanche trail made a stop at Barton Springs, and the tribes left numerous artifacts around the area. In the 1600s and 1700s Spanish explorers looking for gold came through Travis County, and some say that de Vaca, Cabeza de Vaca and Coronado stopped at Barton Springs on their quests. Franciscan friars built the Mission San Jose de los Nazonis in 1730 at Barton Springs. Later, San Francisco de los Neches and Nuestra Senora de la Purisma Concepcion d'Hanis were moved from East Texas to Barton Springs because French troops were pushing them westward. The missionaries thought that the land was worthless for growing crops or settling and moved on to San Antonio. In 1835 the Governor of Coahuila y Tejas granted Barton Springs to Henry P. Hill, and Anglo colonists began settling the area. "Uncle Billy Barton" was one of these early settlers and he settled on what was then called Spring Creek with his three daughters, Parthenia, Eliza and Zenobia. Spring Creek was Barton's link to the outside world, a camp called Waterloo on the Colorado River which was developing into the new Texas capital. He built a cabin there and kept two tame buffalo that apparently attracted many sightseers. Barton started to charge admission to the springs and hired W.C. Walsh and Henry Steussy to build a gristmill. The mill was three stories high and located on the south side of the creek near the main dam. Barton's place was a stage stop and quickly became popular as a favorite swimming hole. When Waterloo was officially selected as the new Texas capital in 1839, Barton deeded the springs to the city to furnish power for a sawmill. William Barton died on April 11, 1840. He was buried at the springs but his body was later moved to Round Rock. There are actually six different Barton Springs in Texas, some that are named after our William Barton. He certainly got around! There are apparently a few other William Bartons but we all know there's only one Barton Springs. Barton Springs was still very primitive in 1842. Sam Houston, who was bitter about Austin becoming the new capital, said that he wouldn't risk his scalp in that #&?! hole called Austin. Houston feared Indians, and since some people had been scalped on their way to Barton Springs, he was somewhat justified. In the 1850s, peaceful tribes of Lipan Apaches and Tonkawas were still living near Barton Springs, but were driven out by Comanches during an attack on white settlers at the springs. In 1860, John Rabb bought the Barton property, then deeded it to his son, Gail T. Rabb. G.T. Rabb sold five acres of the property, not including the springs, to Jacob Stern. Stern built another gristmill and allowed Confederate troops to camp there during 1861. W.C. Walsh, who had built Barton's original gristmill, built a rock quarry in 1866 and moved his family there. Quarrying was done by hand and uncovered many fossils which were preserved. G.T. Rabb opened a gristmill and ice factory in 1871 and built a two-story rock house on the south side of the creek. He also built a dam out of logs and a merry-go-round, and rented swimsuits to men only! In 1879, Rabb constructed a new three-story mill but it was destroyed by fire in 1886. In 1889 he completed a footbridge across the shallow end of the pool but it was wiped out in the 1900 flood. An entrepreneur soon began renting bathing suits to people to swim in Barton Springs. People could also camp there. On Saturdays and Sundays the whole family would pack a picnic, pay ten cents admission, and spend the day at the springs enjoying sing-a-long concerts, plays and dances. Swimming societies and clubs are nothing new in Austin. A ladies' swimming club was formed in 1884 and only one man was allowed within hearing distance as a safeguard. He was under oath to keep his eyes shut and his face turned away from the river. The first bathhouse was just four walls painted white and open to the sky. The walls didn't extend all the way to the ground because of the moisture and potential for rot. Baptisms took place in the springs, sometimes hundreds at a time. In 1875 the Riverboat Sunbeam shuttled swimmers up and down what is now Town Lake and Barton Creek for fifty cents per person. Barton Springs was still very much 'out in the country' at the time and getting there was an ordeal. In 1907 Rabb sold more of his property to Andrew Jackson Zilker, who then bought the other five acres from Stern. Zilker's story is a classic rags to riches tale. When he was just 18 he moved from Indiana to Austin in 1876 with fifty cents in his pocket. The first night he got a job washing dishes and doubled his money. He then got a job constructing the Congress Avenue Bridge and befriended the owner of an ice plant who gave him a job there. Zilker also found the time to be a volunteer fireman, Director of the First National Bank, Water and Light Commissioner, and head of the Travis County School Board. 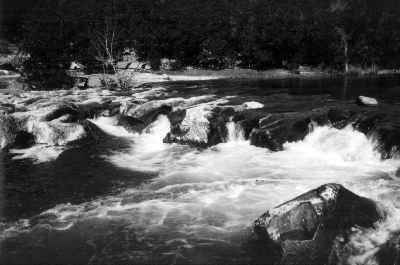 He quickly became the engineer of the ice plant and in 1901 began buying land between the Colorado River and Barton Creek. Zilker had soon acquired 350 acres surrounding Barton Springs and used the land to pasture the horses and mules that pulled his ice wagons.